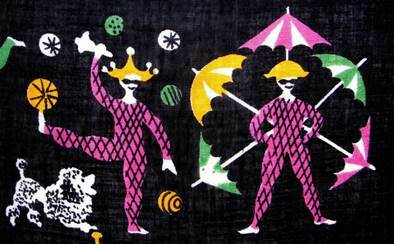 Not too surprising then, that we find images of the circus on hankies for both children and adults. 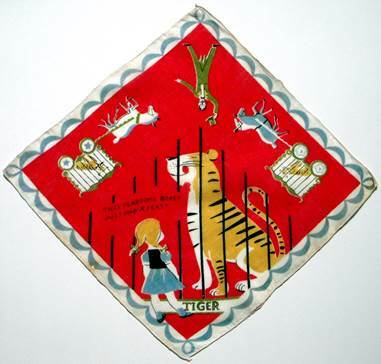 Let’s begin with children’s hankies, and their call to adventure. 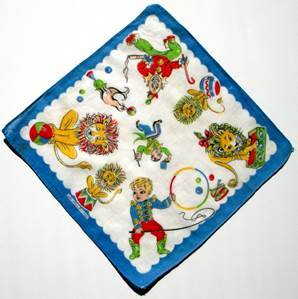 The blue bordered hankie shows a tiny ringmaster dead center, whose presence is far outweighed by the charming lion tamer anchoring the corner, who couldn’t be more than 5 yrs old, yet he’s definitely running the show. 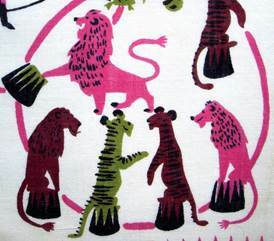 His fearsome lions look mighty cuddly, so there’s no real cause for alarm. 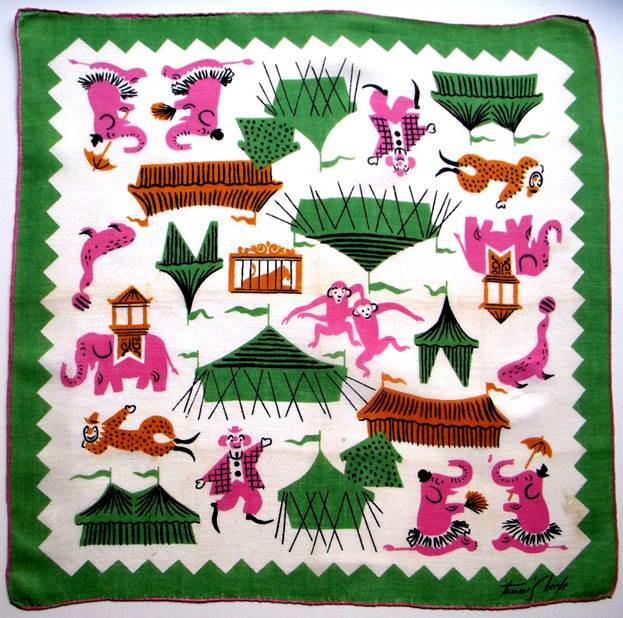 Likewise the silly mustachioed maestro in pink holds sway over a menagerie of bunnies and teddies, perfect for a child’s circus. The little pigtailed miss standing too close for comfort to the caged tiger might be cause for alarm, save for the message which reads “This fearsome beast just had a feast.” (Let’s hope it wasn’t her little brother….just kidding.) The soft blue scalloped frame transforms “fearsome” to “friendly” and the tiger looks more like Tony of Frosted Flakes fame. 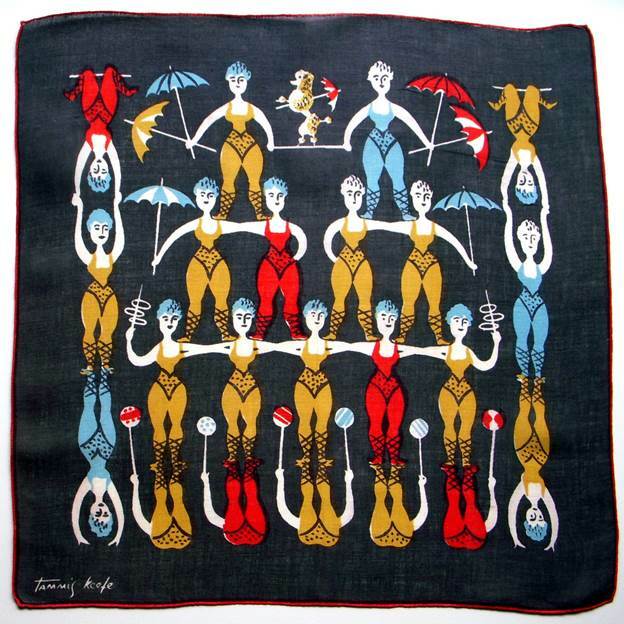 Any little girl would love to have this fiery red souvenir from her day at the circus. 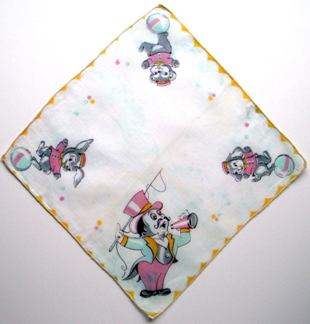 Ah, but the ringmaster of the 1930’s children’s handkerchief is the “real deal” – quintessentially P.T Barnum, this powerful marshal in shiny boots is twice the size of the elephants! There’s no proof Barnum ever said “there’s a sucker born every minute.” He did, however, opine “Every crowd has a silver lining.” 🙂 He gave the people what they wanted, and they came in droves. His maxim holds true for successful corporations today. As speaker and author Scott McKain wisely observes “All business is show business.” You have to capture your customer’s mind and heart before you can capture his business. 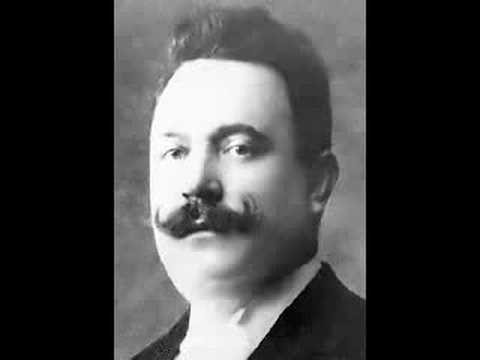 That being said, let’s throw in a little showmanship for you – Entry of The Gladiators, composed in 1897 by Czech composer by Julius Fučik, it was often used at circuses to introduce the clowns. 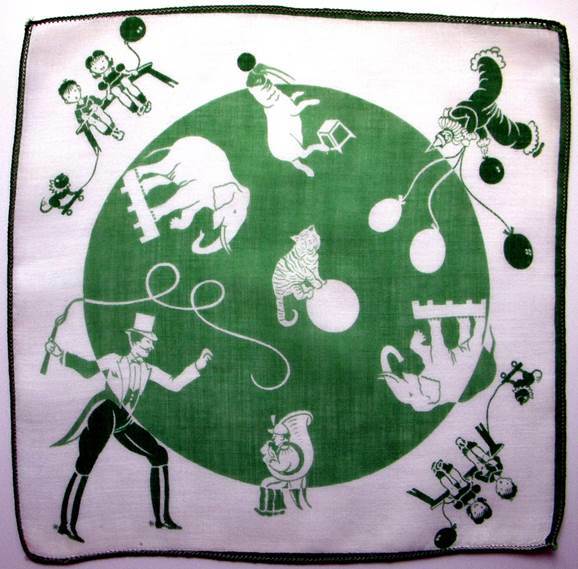 The next circus hankie has it all – side shows, clowns, silly monkeys, caged tigers, and trained seals executed in fresh, friendly colors. It’s totally entertaining and we want to join in the fun. The topsy turvy layout forces your eye to roam about, much like you would at the circus. 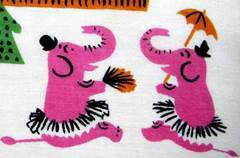 Note the punctilious pachyderms in top hats and tutus sporting fans and umbrellas to ward off the heat. As always, artist Tammis Keefe manages to pack maximum punch in minimum space. Check out the ring with the big cats. We could be back at the watering hole on the savanna (or at the local singles bar for that matter) as the King of Beasts struts his stuff before a pair of admiring tigers. The gals smile and wave in approval, while his wing men eavesdrop to discern what the ladies find most enticing about the show. Some things never change…. 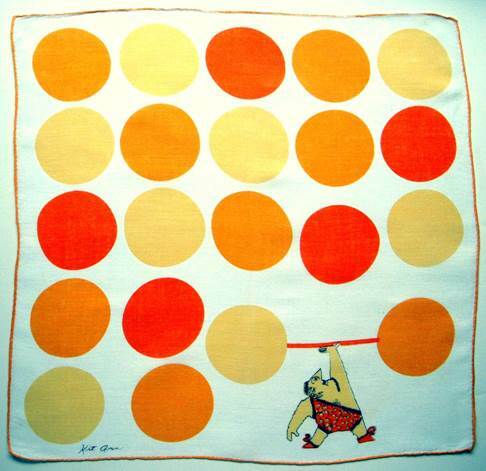 Here’s a perfect harlequin hankie for Guy, with a radiant Soleil shining from every corner. Zip. Zap. Zing. Pop. Pow!! Forget Pilates, aerobics and Jane Fonda, “Hie thee to the circus!” What better workout is there? Love the deep gray, ice blue and gold which make the fiery orange POP! 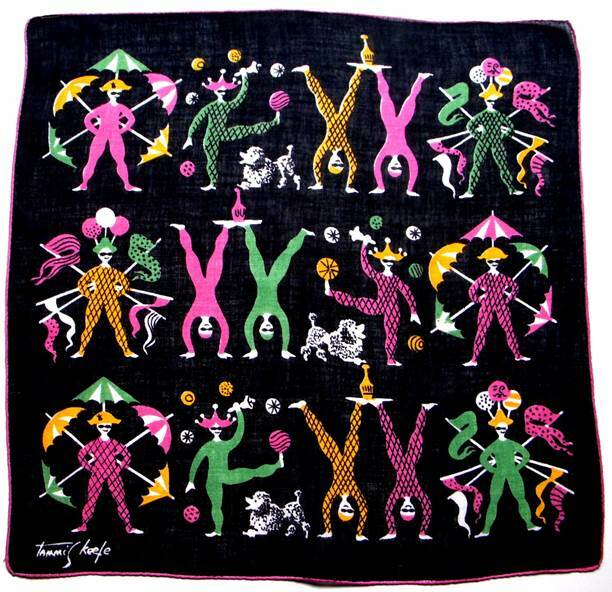 This hankie combines magic with juggling and all manner of eye-catching special effects. 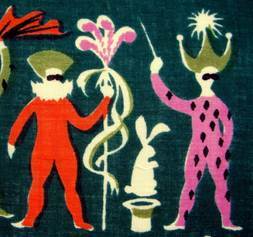 The plumed staffs with streaming ribbons, held by masked harlequins in fanciful hats, evoke images of a Venetian Masquerade Ball. Showmanship at its finest, and we want to join in the adventure. Yes, yes, yes! Speaking of adventure, in 2009 Laliberte became the first Canadian civilian guest to travel into space. I read he undertook the flight the raise awareness about water issues on the plant. Apparently he spoke to Bono at a U2 concert live from space and yes, wore a red clown nose. In case you think he was simply clowning around, in 2007, Laliberte founded the “One Drop” foundation, dedicated to giving poor people access to cIean water, and funded it with $100 million of his own money. Yes, you can live your dream and have fun too. Joy & magic, risk taking & adventure, it’s all there for you at the circus. Perhaps that’s why the men of Monty Python called their group the Flying Circus. More than pals simply fooling around, two are Oxford University graduates, and three attended Cambridge. Their comedy references philosophers as well as literary figures, and they brilliantly skewer politicians. Incisive at their craft, they knew their audiences could swallow sometimes bitter pills if coated with humor. In fact, many in show business describe their profession as being like a circus. Dani Dipierro of Positively Present, shares lessons she has learned from the circus. 1. Be the ringmaster. It’s your life. 2. You’re on a tightrope. Keep your balance. 3. Toss your hat in the ring. Get involved. 4. Set up a sturdy net. You will need back-up. 5. Clown around. Life’s too short to be serious. It’ll all work out in the end”. 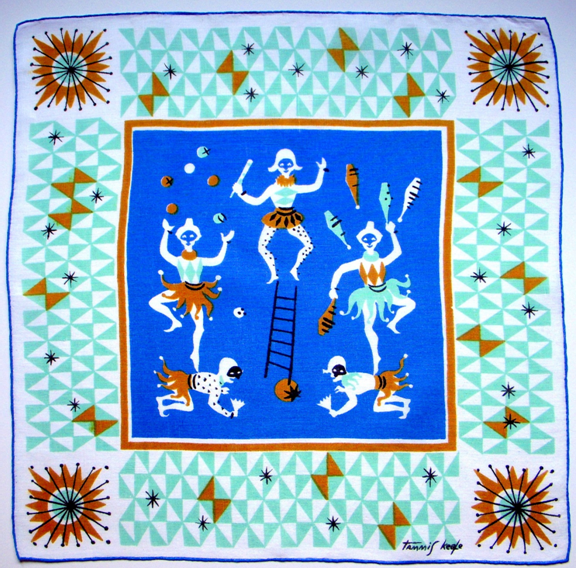 To view our circus hankies in video format, please visit us HERE. What an incredible collection. 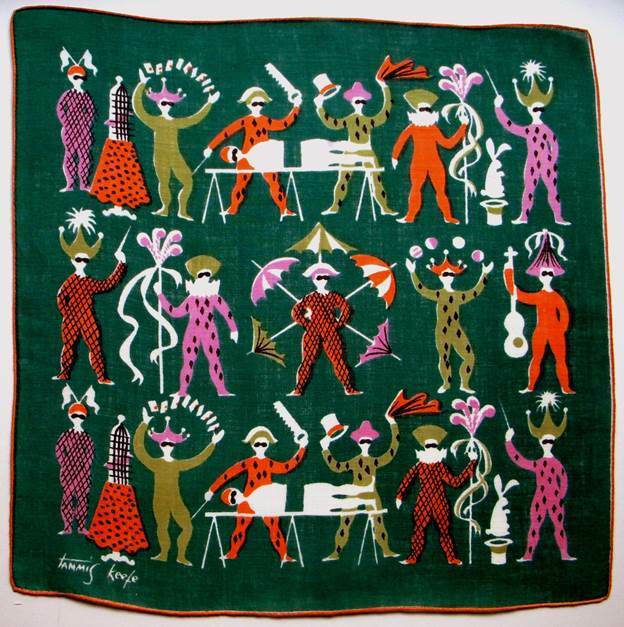 I haven’t seen some of these hankies in person in years. 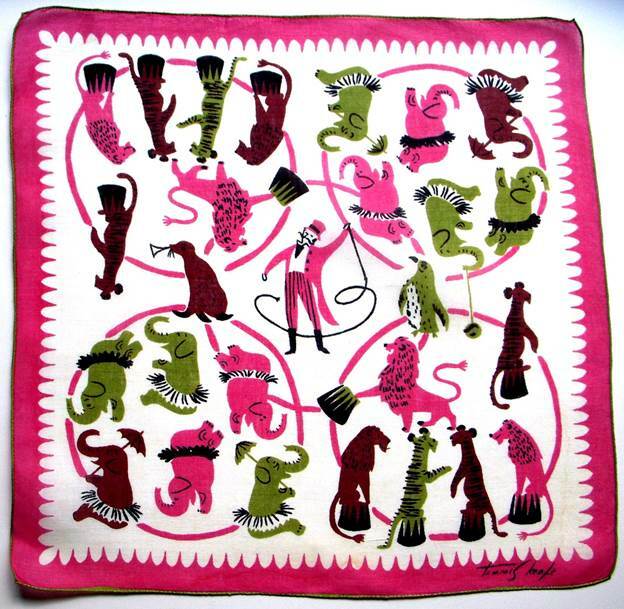 What an incredible collection of Tammis Keefe’s circus theme hankies! You have a top notch collection. LOVE THEM ALL!